You're currently browsing page: /trompeter-musiker-komponist/73/electric-treasures/?lang=en of www.markusstockhausen.de. In September 2007 Markus Stockhausen was invited to organise a special concert in the forum of the ‚Kunst- und Ausstellungshalle der Bundesrepublik Deutschland‘ in Bonn (museum), within the framework of the exhibition „Ägyptens versunkene Schätze“ (Egypt‘s Sunken Treasures). This was a thematic focus that intrigued Markus Stockhausen immediately, and so he decided to take the thought on board and to bring to light treasures from his own musical biography. „I‘ve often followed the concept of groups who are able to improvise freely. 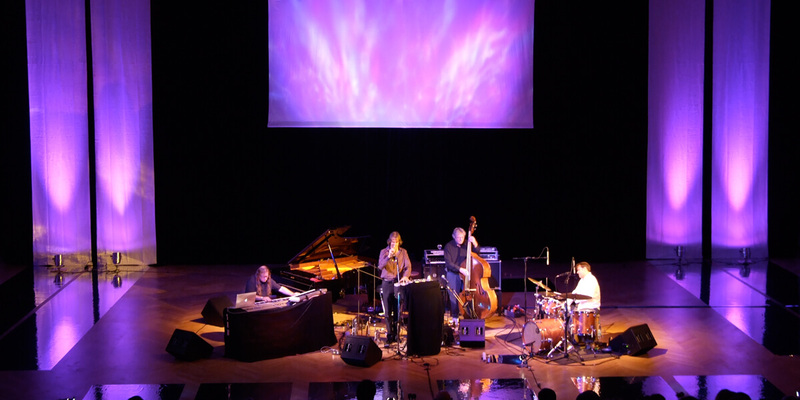 Not in the sense of free jazz, but of a music in which structures, which one might otherwise compose, can appear“ says Markus Stockhausen on his decision to form a new improvising jazz quartet. To improvise and compose music in almost real time together demands a high level of trust. 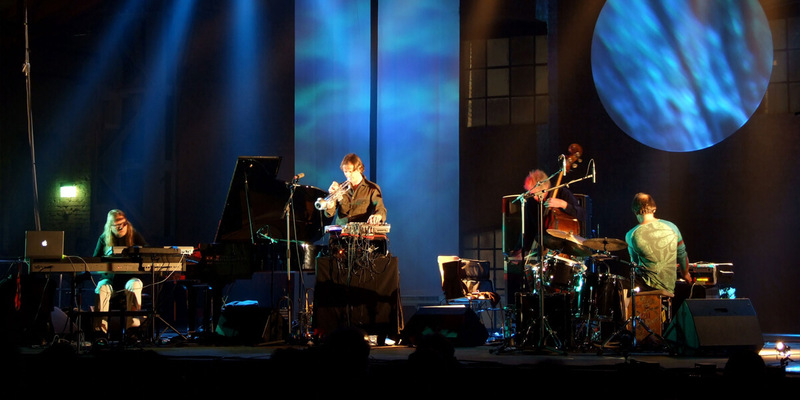 Together with the Norwegian bass player Arild Andersen and the drummer Patrice Héral from southern France Markus Stockhausen has been binding together the collective work on various projects for many years. And so in the year 2000 the work „Kartá“ for ECM came into being. The guitarist Terje Rypdal was an addition to the trio at that time. „Kartá was an important milestone for me. Most of the pieces on this CD had been improvised freely. Because of this a very special music was born. 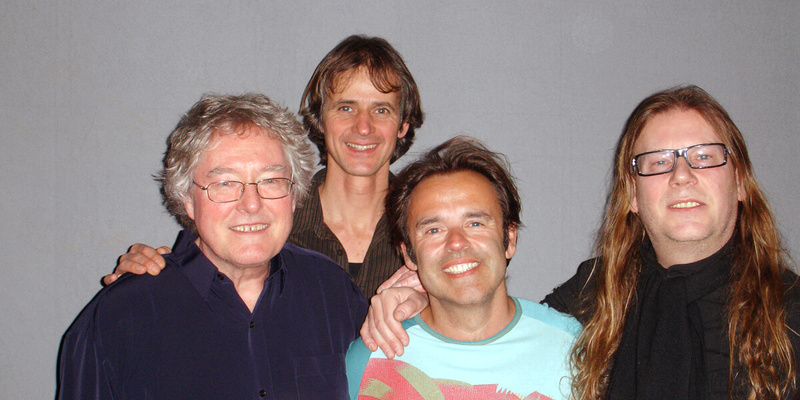 And (…) it was the first moment of playing together with Terje that we recorded“. Since then Stockhausen, Anderson and Héral have been developing a European musical language together in different combinations (e.g. with Ferenc Snétberger on the CD „Joyosa“, Enja Records 2004), and have been expanding their musical vocabulary with regards to the electronic possibilities of samplers, loops, harmonizers etc. In January 2006, by invitation of the radio station Norddeutscher Rundfunk in Hamburg, this successful collaboration was continued under the title „Karta II“. The trio was joined by the Italian pianist Angelo Comisso. In Hamburg the producer Stefan Gerdes spoke to Markus about Vladyslav Sendecki, one of the most fascinating keyboard players in Europe. Some years earlier Joachim Ernst Berendt had already suggested to bring the two together. 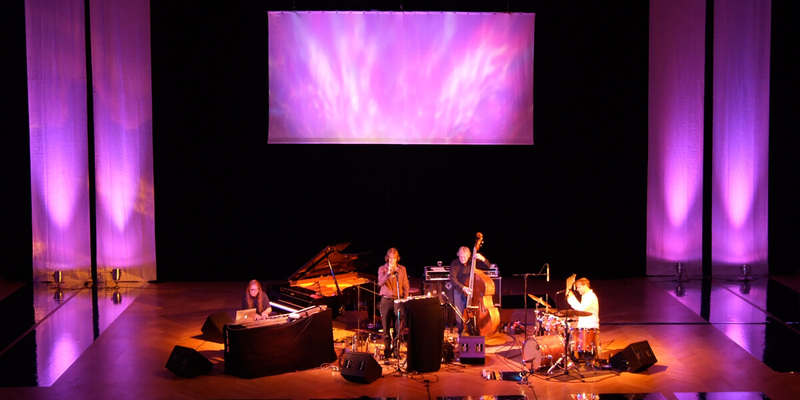 It is certainly true that the energetic tension of „Electric Treasures“ reminds one of the trailblazing „electric“ group improvisations, with which Miles Davis shook up the jazz world in the seventies – for example when Stockhausen wires up the crystal clear sound of his trumpet to a ring modulator or when Arild Andersen intones his unswerving bass grooves with an almost tectonic power. Such associations however only describe a part of the free musical space that is unfolded by the improvisors: from symbiotic acquiescence on the border of inaudibility to driving freebop passages, nervous breakbeat loops (backbeat) on the one hand and tender flugelhorn hymns, the trumpet‘s crystal clear flights of fancy to atmospheres of mystical impenetrability on the other hand. As Vladyslav Sendecki says: ‚It is rare luck, when an improvised music meeting really works, when the contributions of all participants make up a collective work of art‘. «Electric Treasures» is that type of stroke of luck. 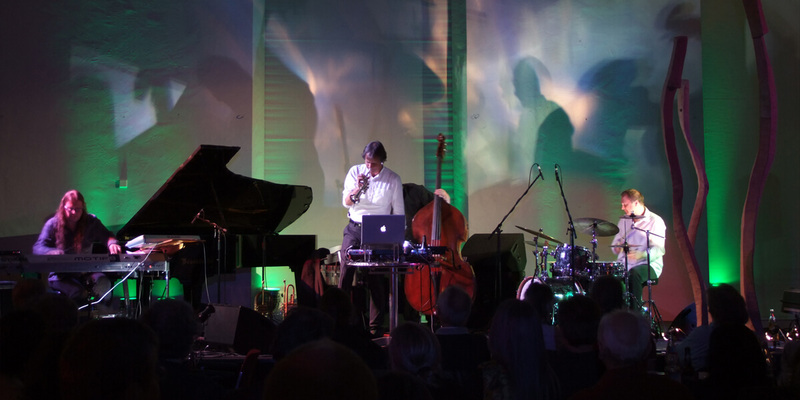 Congenially staged by the artist Rolf Zavelberg with his „Images of Light“, the interaction between the musicians became an experience for the audience. 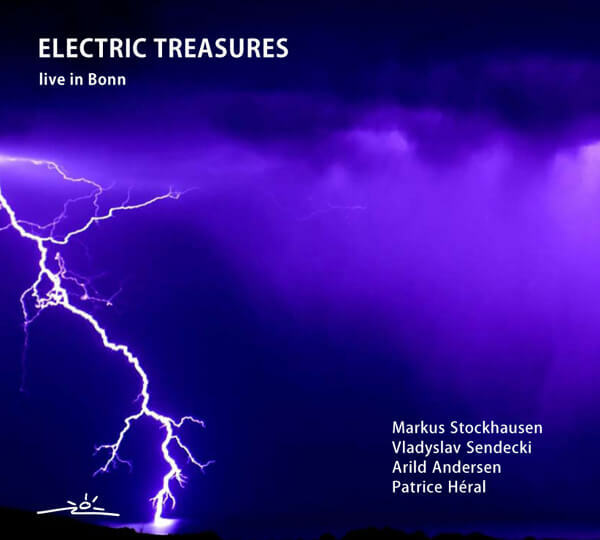 And that experience still lingers: «Electric Treasures» has now been released as a gripping double CD. „It is a statement which is valid in itself – even if our music might sound very different tomorrow, it was a moment that was worth recording“ Markus Stockhausen explains, and continues: „We recorded the concert just in case, as one always wants to have demo material. Vladyslav was the first to hear it and said: ‚It‘s worth making a record out of this‘.“ Together with Christoph Schumacher Markus Stockhausen made the basic mix, then the sound tinkerer Walter Quintus took over the editing of the material and was thrilled: he experienced the quartet‘s freely improvised music as ‚a grab bag‘. “It’s not uncommon to find bassists and drummers who work together so well that they become almost inseparable; often hired together because of their distinctive simpatico. It’s rarer to find full groups with their own signature, expanding their vernacular by recruiting others for alternate ideas. Trumpeter Markus Stockhausen, bassist Arild Andersen and percussionist Patrice Heral have been working together since 1998 but, despite a singular aesthetic, it’s their guest collaborators who have helped build a small but diverse body of work; each project blending recognizable elements and fresh perspectives. Electric Treasures is the first time they’ve recorded with a keyboardist. Karta (ECM, 2000) was a largely spontaneous and more electrified affair with guitarist Terje Rypdal, while Joyosa (Enja, 2007) focused more on composition; featuring acoustic guitarist Ferenc Sentberger, with whom Stockhausen also recorded the lyrical Streams (Enja, 2007). 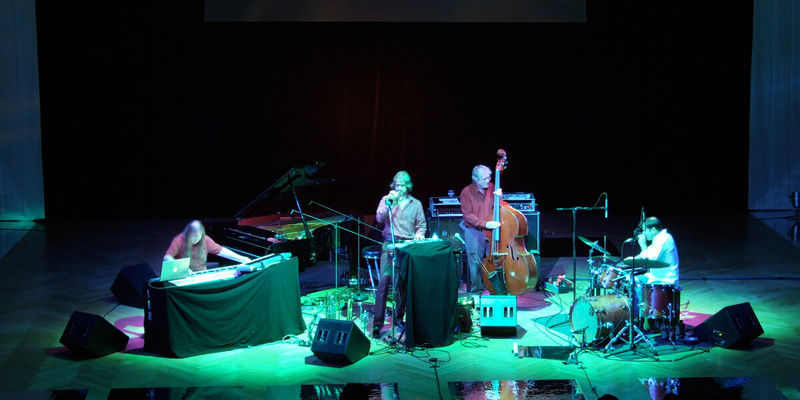 Recorded live with keyboardist Vladyslav Sendecki, Electric Treasures shares more with Karta’s in-the-moment spontaneous composition. Unlike the ECM disc however, where seven of its eleven tracks were culled and shaped from a ninety-minute free improvisation—yet were still each remarkable for their sense of individual completeness—Electric Treasures documents an entire performance from start-to-finish; a document of exactly what went down. With little in the way of advance planning, Electric Treasure is all the more impressive for the quartet’s ability to pull true form out of the ether. While vamp-based pieces act as striking vehicles for the quartet’s stylistic diversity—ranging from unfettered free play and hard-swinging modality to hip-hop inflected grooves and dense, post-Miles jungle rhythms—it’s when they create song-like structure that the true meaning of spontaneous composition becomes clear. Abstraction and electronics-filled landscapes turn “Electric Treasures Ten” into a stunning blend of texture and ethereal melody, but it’s Stockhausen’s thematic lead-in to “Eleven” that—with Andersen and Sendecki picking up on the trumpeter’s implicit changes—makes it a poignant culmination to a two-disc set that, even at its most oblique, remains eminently accessible. Stockhausen’s range has never been captured so completely on a single release, moving from a rich acoustic tone to fiercely processed tonalities and the occasional brash tinge; effortlessly flowing from singable melodies to fiery post-bop phrases. Andersen, a double-bassist who cites the late electric bassist Jaco Pastorius as a seminal influence, seamlessly integrates processing and loops into a virtuosity that never sacrifices substance for style. Heral not only locks in with Andersen as if they were joined at the hip, but allows the music to take unexpected shape as his textural breadth combines with a wildly encyclopedic understanding of pulse, spanning cultures and decades. Sendecki is just as moving, a strong soloist with no shortage of the jazz tradition at play, but equally comprised of influences ranging from classical romanticism to ambient sonorities and transcendent impressionism.